Core i5 vs Core i7: which is best for you? Intel's Core i5 and Core i7 PC processors are as quick as they come. But thanks to Intel's confusing branding scheme, it's not always obvious what the labels Core i5 and i7 really mean. The long list of models on offer plus two different sockets to choose from only add to the confusion. How do you know which is best for you? For some it will come down to price. Full power Core i5 processors extend up to around £200 where the Core i7 chips take over. For everyone else, here's TechRadar's guide to the pros and cons of Intel's top chips. In theory, Core i5 is Intel's midrange processor and Core i7 is its flagship chip. In practice, it's a little more complicated than that. Core i5 processors are available in both dual and quad-core trim for the LGA1,156 socket. Meanwhile, Core i7 processors not only come with four or six cores. They're also available for both the LGA1,156 and LGA1,366 sockets. If it's an upgrade CPU you're after, the crucial first step is therefore identifying the socket in your existing system. If you're building a new PC, every chip from both ranges is potentially on your radar. The key to knowing what you're actually getting is in the triple-digit suffix. The Core i5 is available in two series, the 600 and 700. All 600 series chips are dual-core models based on Intel's Clarkdale core and with HyperThreading switched on. That means they can crunch four software threads simultaneously. The final two digits in the processor name essentially indicate clockspeed. Thus the Core i5 650 is a 3.2GHz dual-core CPU, yours for around £140, and the Core i5 680 is a £225 3.8GHz dual. 700 series Core i5s, meanwhile, are quad-core processors derived from the Lynnfield core but without HyperThreading. Consequently, Core i5 700 chips can also handle four threads, but offer more performance because each thread gets its own core. Currently, there are just two models available, the 2.66GHz Core i5 750 and 2.8GHz Core i5 760. Both sell for around £140. Given the extra cores of the 700 series chips, it seems slightly crazy that they tend to be cheaper. However, Clarkdale-based Core i5 600s do have an added extra. They've been fitted with an integrated graphics core. Admittedly, it's not much of a graphics core. But it does mean you don't have to buy a dedicated video card. Just remember that you need a supporting motherboard to enable the graphics core in Clarkdale chips. That said, the cheaper quad-core 700s offer much better all round performance. Unless power efficiency is a major issue for you, we wouldn't bother with the Core i5 600 chips. They're overpriced. But what about the Core i7? Pay attention, because this is where things get really tricky. 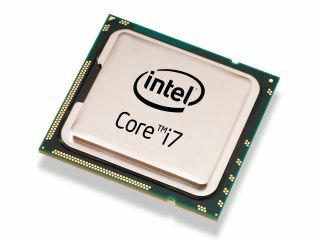 The Core i7 800 series is essentially the same as the Core i5 700 series but with HyperThreading enabled and higher clocks. It's based on the same quad-core Lynnfield processor die and drops into LGA1,156 socket. So, the Core i7 870, for example, is a £230 quad-core 2.93GHz chip that can process eight threads simultaneously. At the very top of the range, we find the Core i7 900 series. This is where Intel's branding really goes bonkers. The easy bit to grasp is that all Core i7 900 processors require the high end LGA1,366 CPU socket. This offers more performance potential but also demands three sticks of pricey DDR3 memory for optimal operation. LGA1,366 motherboards also tend to be pricey. However, what isn't obvious from the branding is the fact that 900 series Core i7s are available in both quad- and six-core format. There really is no other way of telling other than a full list. Thus the Core i7 930, 940, 950 and 960 are quad-core processors while the 970 and 980X chips pack six cores. Price-wise, there's a huge variation. The 2.8GHz quad-core 930 is actually excellent value at £210. By contrast, the two six-core chips are very, very quick. But it's debatable whether they are really worth £700 or thereabouts. Finally, you may come across chips with either a "K" or an "X" tacked on the end of the name, such as the aforementioned Core i7 980X or the new Core i7 875K. These letters denote specialist models aimed at overclocking enthusiasts. The key difference is an unlocked multiplier, making frequency adjustments much easier. Taken as a whole, then, Intel's range of Core i5 and i7 CPU can be utterly baffling. But there is something to suit most budgets and requirements. As for where our own dosh would go, we'd take a Core i5 760 if money was tight or the Core i7 930 if things were looking up.